Shirley Aerts, of Strathroy, helped to deliver 6,015 bedkits for Sleeping Children Around the World in Uganda. Photo taken by Annette Arnold. 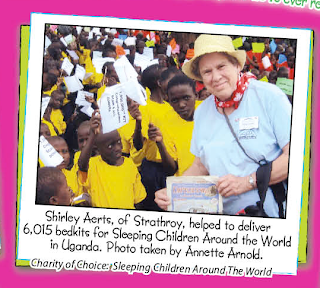 When the photo was published, she won $25 for Sleeping Children Around the World. Donation aside, why pay $12 for a bar of soap when some mass brands sell three to a pack for four bucks? “You’re paying more for what’s not in it,” says Baker. That means no animal by-products or any of the regular unpronounceable synthetic ingredients found in cheap bars of soap (some of which been otherwise banned in American baby foods). No trace elements of herbicides, pesticides or hormones, no chemical preservatives. “Bar soap, made properly and saponified properly, is not vulnerable to bacteria and doesn’t need preservatives anyway,” says Baker. Consonant's charity of choice, SCAW, takes a similar approach. It was started by Murray Dryden, father of hockey players Dave and Ken Dryden, who created a trust to cover administrative costs. “So when you give $35 toward a bed kit for a needy child in a developing country, it’s $35 for a bed kit,” Baker says proudly. I feel cleaner already. Bill Baker gives 100 per cent. So do Margaret and Murray Dryden. So when Baker's Consonant Body Organic Skincare company was looking to support a worthy cause, the Drydens' Sleeping Children Around the World organization, which distributes bedkits to needy children in developing countries, was a natural fit. 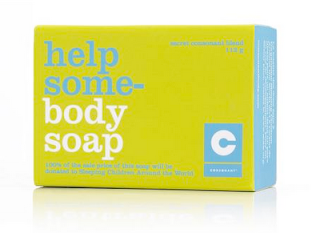 Baker came up with Help Somebody Soap. The $12 bar is a "blend of spirited and earthy botanical oils with a hint of citrus and patchouli." Just as 100 per cent of donations to Sleeping Children goes to providing bedkits, 100 per cent of the price of the soap is going to the non-profit organization. Bedkits, which cost $35, include a mattress, pillow, sheet, blanket, treated mosquito net and clothing. 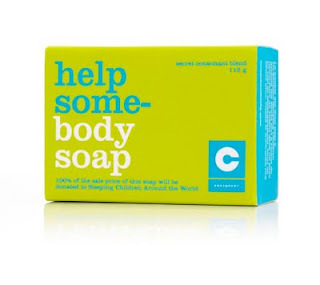 Help Somebody Soap is available at the Bay and Sears flagship stores, specialty shops and online at www.helpsomebodysoap.com. For more information about Sleeping Children Around the World visit www.scaw.org. 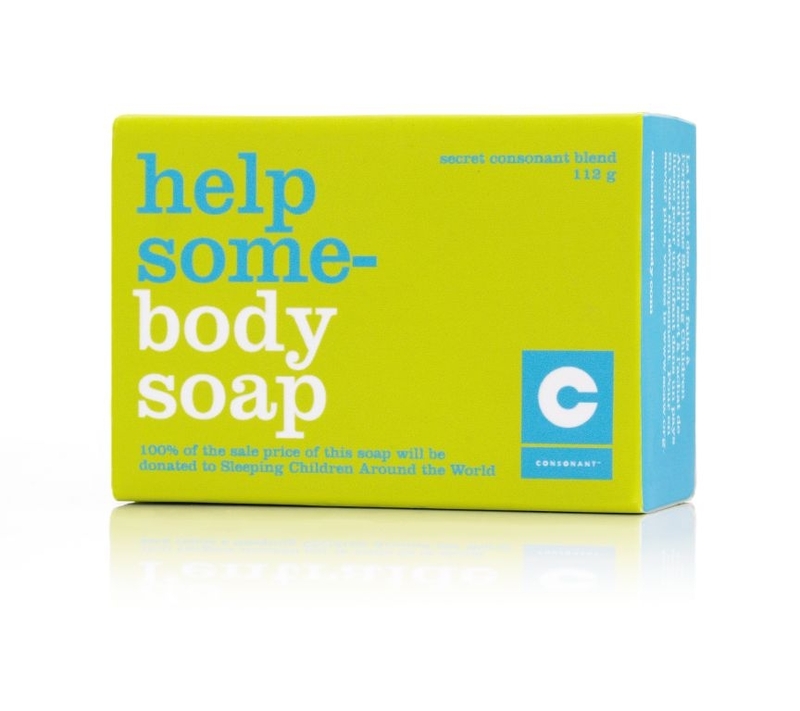 This Consonant Help Somebody Soap would make a great stocking stuffer for anyone! I was recently sent a sample and am impressed by the cute packaging, subtle scent and great cause. All $12 of the purchase price of this 100 per cent natural product is donated to the Sleeping Children Around the World (SCAW) charity, an organization that distributes bedkits to needy children in developing countries (you can find out more info on SCAW here). According to their website, Consonant Body products are made with natural ingredients like fair trade and organic oils, and are free of artificial colours or dyes. You can purchase Consonant products at Sears or online here. Don't forget to enter my current giveaway, I'll be choosing a winner on Monday. Racking your brain to find the best Christmas gifts for your loved ones? Find some great DIY holiday gift ideas in our Craft section, and sign up for our craft newsletter Get Crafty and get great crafting ideas directly to your e-mail inbox. This 100% natural and organic soap is wonderfully fragranced with a blend of spirited and earthy botanical oils with a hint of citrus and patchouli. Consonant is proud to be donating every penny of the sale price ($12) of this limited edition soap to the fantastic Canadian charity Sleeping Children Around the World. 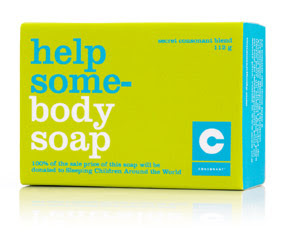 As noted above, 100% of the sales of this soap are being donated to Sleeping Children Around the World, the 100% charity. 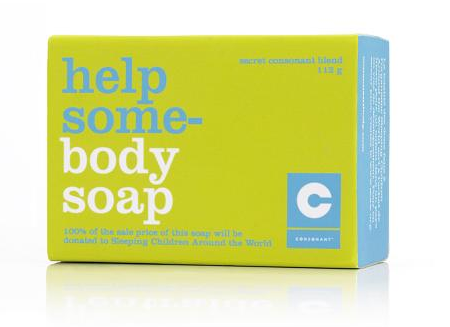 You can buy this body soap at the Consonant website or at stores across Canada. “And to All, a Good Night.” Four Seasons Hotels and Resorts announces Gift Card campaign in support of Sleeping Children Around the World. In the spirit of the holiday season, for every Four Seasons Gift Card sold from December 1 through 10, 2009, Four Seasons Hotels and Resorts will donate the cost of one bed kit to Canada-based charity Sleeping Children Around the World. This not-for-profit organisation believes that it is the right of every child to have a comfortable night’s sleep. It provides bed kits including life-saving items such as treated mosquito nets for children in areas prone to malaria, along with fundamental necessities such as a mat, sheets, blankets, clothing and more. In 2009, Sleeping Children Around the World delivered its millionth bed kit. Founded in 1970, Sleeping Children Around the World is dedicated to offering children in developing countries something fundamental to a successful future – sound, safe slumber. At the heart of the programme is the bed kit, each costing CAD 35.00, the contents of which not only allow for a comfortable sleep but also fight off the threats and diseases specific to each region. Bed kits are produced locally in each distribution country, eliminating transportation costs, assisting local economies and ensuring that the contents of the bed kits are suitable for the area. With 100 per cent of monetary donations going directly to the purchase of bed kit components, the charity is fuelled by the passion of its volunteers, who assemble bed kits and personally deliver them to communities in over 33 countries – including India, Kenya and the Philippines – at their own expense. “Reaching one million bed kits has fulfilled founder Murray Dryden’s dream, but now we are looking ahead to what we can achieve in the future. This campaign will provide vital funds for an optimistic start to 2010,” says Linda Webb, Executive Director, Sleeping Children Around the World. To help support the campaign, visit the Four Seasons Gift Card web site or any Four Seasons Hotel or Resort worldwide from December 1 through 10, 2009, to purchase a Gift Card. The easy-to-order Gift Cards may be personalised for delivery and are available in a variety of denominations from USD 100.00 to USD 5,000.00 online and from USD 50.00 to USD 100,000.00 at Four Seasons Hotels and Resorts worldwide. 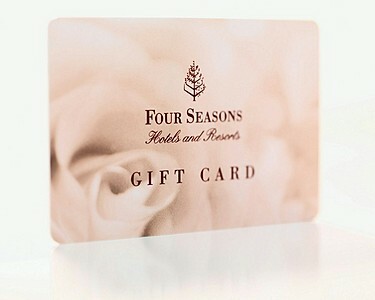 Smart-phone users can now purchase Four Seasons Gift Cards from the new and secure mobile Gift Card site. For the 16th year in a row, St. Thomas and St. George's Anglican Churches in Owen Sound have set up their display at the Heritage Mall to promote Sleeping Children Around the World and sell bedkits. Looking after things on Saturday afternoon were (Left to right) Cara Douglas, Audrey Beatty, and Lynda Douglas. Nearly 40 years ago, Murray Dryden stumbled over a child sleeping in the street in Pune, India. Soon after he and his wife, Margaret, founded Sleeping Children Around the World (SCAW), with a mission to provide a peaceful night's sleep for children living in developing countries. On their first donation trip they delivered kits consisting of a mattress, mosquito net, school supplies and a set of clothes to 50 children that didn't have beds. This summer, SCAW delivered its millionth bed kit. Dave Dryden, the former NHL goalie, is Murray's son and chairman of the organization. He credits SCAW's success to the business model his father created: Every cent donated to the charity has gone directly toward the purchase of bedkits. "It's important for people to know exactly where their money is going," Mr. Dryden says. "There's a skepticism out there about donating to charity." The 100% promise is achieved in several ways. Before he passed in 2003, Murray Dryden built a sizeable nest egg -- called the Legacy Fund -- from which all operating expenses are drawn. The charity is run from the Dryden family home in Toronto. SCAW does not advertise; for 39 years the company has grown solely through word of mouth. There is only one paid employee -- the rest are volunteers. The charity performs a dozen donation trips a year to more than 30 developing countries, where it partners with local service clubs, such as Kiwanis, Rotary and Lion's clubs. These clubs in turn connect them with needy children. The money is given to the clubs, who donate their time to buy the materials locally for the kits. This provides a boost to the local economy. Canadian SCAW volunteers pay their own expenses to travel to the various countries and distribute the kits. It's the kind of trip that attracts retired couples and older adults looking for unique experiences and a chance to give something back. Each kid is photographed with their new bed, so the donor gets a smiling souvenir or gift. SCAW's mission and business model has caught the attention of Consonant Body, an organic soap company. 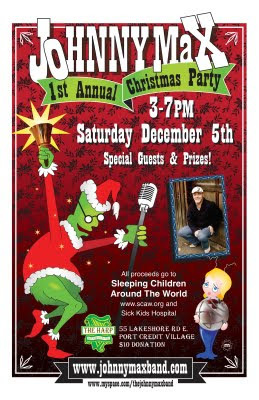 They created SCAWbranded "Help Somebody" soaps, sold at The Bay, Sears and specialty stores, and donate 100% of the profit to the charity. Because the Legacy Fund has begun to dwindle, SCAW has taken its first big step into the corporate world. "We were mainly funded by individual donors, churches, schools and service clubs," Mr. Dryden says. Last spring, it hosted its first annual Pinehurst Club breakfast meeting and invited the business community. TD Canada Trust was the main sponsor and donated the meeting space. Toronto Argonauts vice chairman Pinball Clemons was guest speaker. "Businesses were thrilled about keeping the organization running as it does," Mr. Dryden says. The event raised $92,000 for the operating fund, and another $15,000 for the kits. Which, at $35 a kit, means more than 400 kids will get a new bed. Saturday, November 21st 2009 – 9 am. to 1 pm.